A Clark Kellogg personal appearance, Clark Kellogg speaking engagement, or Clark Kellogg endorsement will reflect well on your company. To hire Clark Kellogg now for any corporate appearance, fundraiser, motivational speaker event, personal appearance, autograph signing, or website endorsement please contact our celebrity agents at 1-877-6-SPORTS. We will contact Clark Kellogg or contact Clark Kellogg's agent and provide you with the booking fees and availability immediately upon your request. Direct Sportslink is the only sports speakers bureau and talent booking agency based in the United States securing only sports talent for corporations, associations, and organizations for motivational speaking engagements, personal appearances, and endorsements. We are the premier sports celebrity booking agency and a sports celebrity procurement expert. Accordingly, we will provide you with any relevant Clark Kellogg website information and booking agent details so that you can hire Clark Kellogg for your next event. From 1979-82, Kellogg played for Ohio State University, where he earned All-Big Ten Conference and Most Valuable Player honor. In 1982, Kellogg was the 1st round draft pick of the Indiana Pacers. He played five seasons for the Pacers before chronic knee problems forced him to retire. 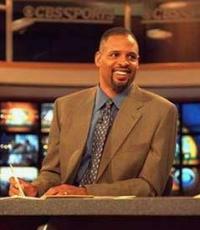 In 1990, he joined ESPN as a basketball analyst. He also worked for the Big East Network and Prime Sports. Kellogg also began working as a television analyst for the Indiana Pacers. 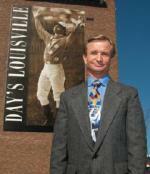 From 1993-94, Kellogg served as a game analyst for the CBS Sports coverage of the NCAA Tournament. From 1994-97, he served as a studio co-host for the early round coverage of the NCAA Tournament. In 1997, Kellogg joined CBS Sports full-time as a studio/game analyst for college basketball coverage. Kellogg replaced Billy Packer as CBS lead basketball announcer beginning in the 2008–2009 college basketball season. In March 2010, Kellogg played a game of H.O.R.S.E. against U.S. President Barack Obama. The game, called "P.O.T.U.S." for the occasion, was won by Obama, who had P.O.T.U. to Kellogg's P.O.T.U.S. Video of Obama & Kellogg playing basketball. During the 2012 NCAA men's tournament, the Ohio Bobcats, for whom Kellogg's son, Nick, played, advanced to the Sweet Sixteen round at the same time Kellogg was calling another tournament game elsewhere. Kellogg, in an understandable digression from his impartiality as a commentator, exclaimed "Way to go Bobcats!" when the final score rolled on his monitor. Kellogg's voice appeared in the popular NBA video game NBA 2K10 as the color commentator alongside Kevin Harlan. The pair rejoined for the game NBA 2K11 as well as NBA 2K12 (with Steve Kerr). Based on your interest in Clark Kellogg as a speaker or for a personal appearance, Direct Sportslink has provided you additional links below for other sports talent with similar appearance fees, speaker topics, and categories that match Clark Kellogg.